Last week, signaling upcoming major policy changes, Twitter suspended or removed verified badges from the profiles of several users who habitually engage in white supremacist rhetoric and hateful speech. 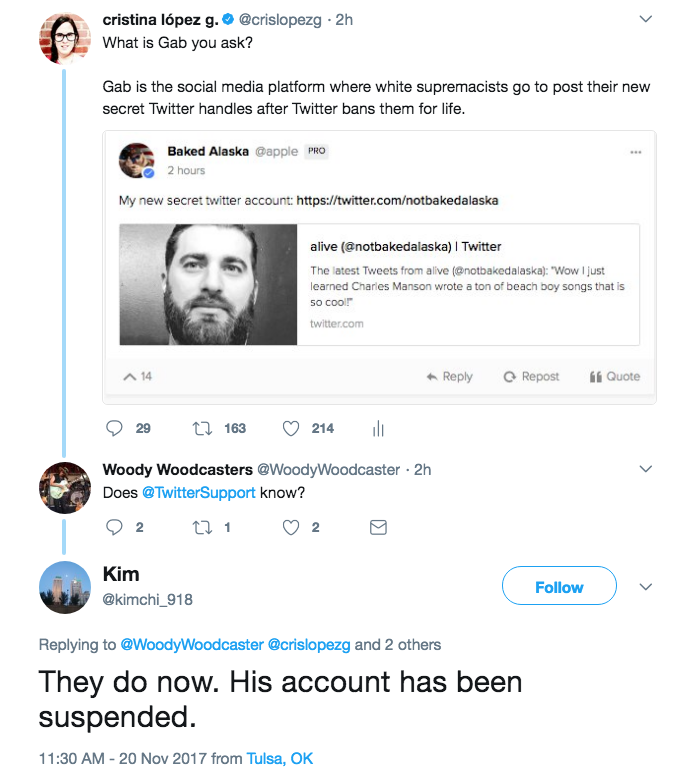 One of these users was Tim Gionet, more commonly known online as “Baked Alaska,” who was permanently banned from the platform on November 15. Gionet regularly tweeted about the “persecution of white people,” as Gizmodo put it, and his tweets often contained neo-Nazi imagery and Hitler apologism. Though Twitter did not comment specifically on Gionet’s suspension, its spokesperson pointed Mashable to the company’s “hateful conduct policy,” specifically the section that mentions “repeated and/or non-consensual slurs, epithets, racist and sexist tropes, or other content that degrades someone." Many far-right personalities had meltdowns over losing their blue checkmarks. Conspiracy theorist Laura Loomer compared her plight to the Holocaust, white nationalist leader Richard Spencer asked, "Is it not okay to be proudly White?," and Gionet livestreamed an eight-hour rant from an In ‘N Out Burger parking lot. Predictably, users alerted Twitter to the situation and that account was also suspended. Twitter still has a long way to go when it comes to dealing with the hate speech, harassment, and other abuserampant on the platform, including by better clarifying its terms of service and policies to define these violations. But kicking out the most blatantly toxic elements is a pretty good start.